Impco™ Thick Stock Pumps are medium consistency twin screw pumps with a vertical screw placement. As with other high density, positive displacements screw pumps, efficiency and reliability are keys for maintaining an efficient operation. At Schurco we have implemented a comprehensive repair program to restore your Impco™ thick stock pump to its original factory condition, all while saving you thousands of dollars and providing you with the peace of mind you can rely on. Our 100,000 square foot repair facility located in Jacksonville, Florida has the ability to repair all of your Impco™Thick Stock Pump needs. We have experience with the Impco™ 400, 600 and 800 Thick Stock Pumps. 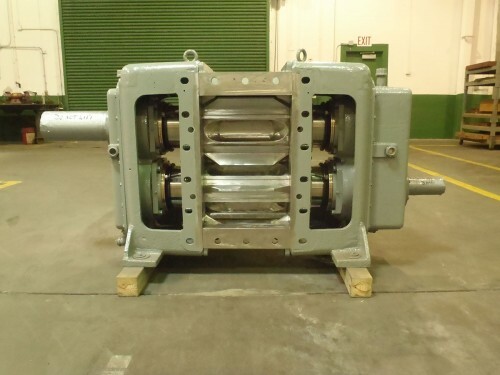 All clearances, tolerances and dimensions will be restored to OEM conditions and our trained engineers may be able to provide recommendations to improve the efficiency and reliability of your thick stock pump based on your particular application. All repair are guaranteed with a 2-Year Limited Warranty and we also may be able to provide a loaner pump in the event of an emergency or shortage.